Artwork by Alison Erika Forde. “My name’s Seleena and I am brown. I wrote that in January 2014 for the introduction to my new zine Brown Girl. In late summer 2013 I decided I was going to make a zine called Brown Girl and it would be all about me. Sort of like a perzine*. Only I’ve always made fanzines that just happen to have a lot of me personally in them. The first issue was a bit of a mish mash and was written entirely by me, with pieces about friends, family, music, hair, rants, my art and being a black weirdo. I was a little nervous putting it out, even though it wasn’t a hugely deeply personal account of my life, but I guess one I have never fully documented in a zine, my blackness. The zine was well received and even though I was unsure about it as a whole and its coherency I felt proud to be taking up space, a space so often taken up by white people. Perzines, zines, writing, self-publishing, think pieces all stuff that has a super white face. It spurred me on to make two more issues. Issue 2 came out in May 2015 and featured contributions from a bunch of friends. Which I thought was a great idea to break up my voice and also by this point I think I’d decided I wanted to make Brown Girl more like a Black magazine zine than a perzine, its featured Art by others, pieces on food and calling out, band profiles, great organisations and reviews of books, music, films and exhibitions. 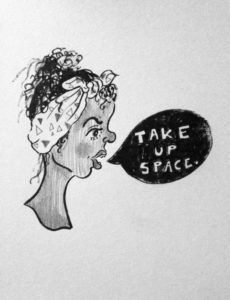 I was aiming to make an issue a year and be a round up of thoughts, opinions and a celebration of brown girls, queer punks and black weirdos. Sadly 2016 came and went but I managed to get Brown Girls 3 out in July 2017. The biggest and I think best issue to date. Despite being the most ‘magazine’ like on paper, it is my most personal to date, with me speaking honestly about being mixed race and also speaking openly for the first time about my sexuality. It’s the issue I am most proud of. I am currently working on issue 4, slowly but surely. The existence of Over Here Zine Fest is spurring me on. 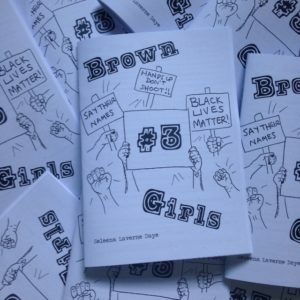 I want to be in a room full of zines like Brown Girl and zines not at all like Brown Girl, but zines all made by POC. I just want to see Brown Girls Taking up Space. *A perzine stands for personal zine and is usually mostly about the person writing it as opposed to a zine about another subject matter. More like a diary zine.